# 1 BEST OF OUTDOOR LAWN BACKYARD GAMES. 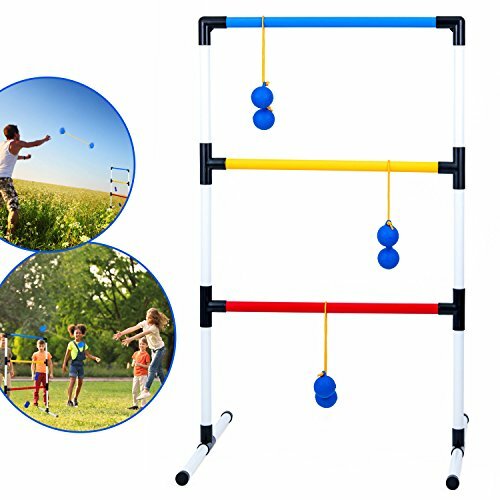 This ultra-fun classic outside backyard game of ladder ball is perfect size to take along outside, or any outdoor adventure for hours of entertainment for your kids, children, and the whole family. Ideal for trips to the beach, barbecues, tailgate parties, pool parties, outdoor events and more. OUTDOOR ACTIVITIES LADDER BALL GAME. Take this yard game along with you for fun activities for you and your family, kids, girls, boys, children and everyone else. Game includes 3 bolas and standing target for 3 goal settings. Portable collapsible game sets up in minutes and folds down for compact storage or transportation. Quickly assembles for instant play to a size 36 inches high by 23.5 inches wide. LADDERBALL GAME PLAY SOLO OR WITH A GROUP FOR HOURS OF ENTERTAINMENT. Throw like a pro to defeat your opponent in this super fun target toss game. CREATE EXCITEMENT AT PARTIES WITH THE BOLA TOSS LADDER BALL TARGET GAME. Your friends and family will thank you and appreciate you throwing a great party and will be grateful to you for the fun and excitement they will have at your events and occasions. IDEAS IN LIFE COMMITMENT: At Ideas In Life we are committed to providing you with innovative solutions to modern living. WE GUARANTEE IT! We want you to be satisfied with our products, so you can buy with confidence! Click the orange ADD TO CART button to order Now!  TONS OF FUN FOR ALL AGES WITH A CLASSIC LADDER BALL GAME that fits perfectly in your beach yard lawn games collection or for your family camping vacation. It's so much fun playing with this simple ladder golf toss game, from the age of 5 to 75 and everyone will have fun. This kid friendly set is made from premium PVC material, lightweight & safe use.  NEED SOMETHING TO KEEP YOUR FAMILY OCCUPIED AND ENTERTAINED? Have you been searching for both indoor & backyard outdoor games for quite a while now? This party ladder ball game will turn out to be a hit that everyone will love. Players of all ages and abilities can get active with the easy to play. One ladder and 6 soft rubber bolos are included.  SETS UP IN A MINUTE with NO TOOLS REQUIRED - You can instantly set this toss across game up when it will arrive the day of a birthday backyard pool party and everyone will have a blast playing it. This ladder ball game set is sturdy and easy & quick to set up! Play the game indoors on a rainy day or outside at a backyard barbecue, tailgating, dinner, birthday or beach party.  LADDERBALL GAME PLAY SOLO OR WITH A GROUP FOR HOURS OF ENTERTAINMENT. The distance determines the challenge, plus the bolos are easy for the gamers. The adults usually get very competitive and become quite good in very little time in tailgate games. Because the balls are soft rubber, you can play indoors as well as outdoors, single or with a team.  DO YOU LOVE PLAYING GAMES THAT REQUIRE ONE HAND so you can hold your drink also? This ladderball set is a fun game that would be great for play dates, birthday parties, and family barbecues. It's easy to learn, easy to play and entertaining enough that older family members can enjoy joining in.